Finding the right Keller TX Self Defense Classes for you and your family is something that needs to be taken very seriously. 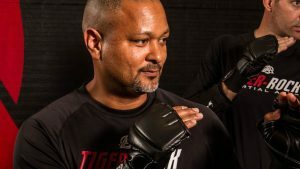 Are you currently going through the process of weighing your options and finding exactly what you need to learn how to properly defend yourself? If you’re trying to get this done but you don’t know exactly where to start, we have the right resources or you. With Tiger-Rock of Keller, Texas by your side, you’ll be able to count on martial arts training at all times. Tiger-Rock is an entity that first started back in the year of 1983. Ever since our founding, we have steadily grown and developed our business into something incredibly special. Today, we are the most successful and well-known martial arts franchise in all of America. You can count on our methods along with the certified instructors we’ve accumulated to give you the guidance you need. Classes and courses should not be taken lightly, and we want you to get the most out of our martial arts training. If you’re trying to master this, we’re here to help. Korean Taekwondo is what we teach at every single dojo in America. This is a very established martial art, and it’s one that all of our instructors have mastered. You can count on the team we’ve developed to help you get the most out of what you’re trying to find. Taekwondo is something that develops your mind, body, and soul. Everybody wants to get better, but not all of us know where to go to accomplish this. If you’re re-committing yourself to success, this is a place that can help you become the person you’ve also envisioned. Are you currently very unsatisfied with your level of physical fitness? Maybe you’re unable to carry your groceries by yourself and you frequently find yourself seeking assistance. Perhaps you’re unable to run a mile, and now you’re beginning to question your abilities in all aspects of life. These are very discouraging things, and it can be very difficult to get through them alone. If you’re ready to start getting better and developing yourself, make sure you visit Tiger-Rock. We understand how important physical fitness is. Your body is your temple, and it needs to be molded and crafted into one that can withstand the test of time. If you’re trying to make sure you get the most out of your physicality, commit yourself to our programs and you’ll be just fine. We’re able to put you through rigorous exercises that involve kicks, strikes, and other forms of full-body movements. Not only will you be getting some great exercise, but you’ll also be able to start getting your karate skills under control. You’ll master the form and movement in no time if you’re doing this consistently. In addition to general martial arts and Taekwondo, we also have Keller TX Self Defense Classes for our students. Are you someone who is always worrying about what you’re going to do in the face of danger? Maybe you’re frequently walking alone at night, and you don’t know what you should do if an assailant suddenly approaches you. This is something that can drive people towards paranoia, and it needs to be kept in check. If you’re trying to make the most of your capabilities, this is the best way to do exactly that. Make sure you’re able to learn about self-defense skills by visiting our dojo. We put you through lifelike drills and exercises that will give you the reps you need to develop your instincts. While nothing can replace what it’s like to really be in the face of danger, we have done our best to create classes that help you prepare. Unfortunately, you never know when you might need these skills. If you’ve ever put to the test by a potential assaulter, make sure you know how to protect yourself and make it out alive. TRMA is here to assist you in this journey. And our experts will make sure you’re ready to put up a strong defense. We’re a family-friendly dojo that wants everybody to enjoy our classes. Do you have some young children who are in preschool and kindergarten? If so, you probably want to immerse them in martial arts at an early age. Maybe you’ve got some adolescents who want to learn karate, or you and your adult friends want to start training at a Keller TX karate dojo. Whatever the case may be, know that Tiger-Rock can play an incredibly beneficial role on your road towards redemption and betterment. Everybody wants to prove to themselves that they’re able to break down barriers and obstacles. With our instructors on your side, you’ll be able to succeed in the face of danger and doubt. Visit our local dojo for details! Contact our dojo today to learn more about our Keller TX Self Defense Classes. Protecting yourself is one of the most important skills you can have, and everybody wants to get better. If you’re trying to make sure you have the instincts and confidence to overcome an assailant, contact Tiger-Rock today. Our dojo is a great place, and we have developed an atmosphere that is conducive to learning and development. We’re ready to work with you and provide you with an introductory course package to start your journey! Call us today for more details and information about our class scheduling. Keller is a great place to live if you want the benefits of a small town mixed with the culture of a large city. Keller is part of the Tarrant County, and it is the 74th most populated city in Texas. As part of the Dallas-Fort Worth area, you will have access to a great metroplex. It can be tough to pick a city for living, but this is a great place to be. If you’re looking for affordable real estate prices, this is a near-perfect community. Our first settlement was in the 1850s, and we have since evolved into a modern hub for business and living.